Electrical and mechanical tools require the highest possible level of safety before, during, and after the procedure is over. The same is crucial for your safety and superb performance when you want to use a biscuit joiner. Therefore, you must comply with all biscuit joiner safety rules. In this article, you will learn how to prepare the work area, secure the wood, prepare the machine and the tools for use, stay safe during the work, and protect yourself and the machine after the procedure is over. Stay with us and learn more about biscuit joiner safety precautions now! As a biscuit joiner is an electric machine with a very sharp blade, you must always comply with all safety rules. This implies all stages of work. Namely, we are talking about preparing the equipment, preparing the wood, securing all elements, making sure the blade and the machine itself are properly working, wearing safety equipment, and complying with guidelines and rules during and after the work. Let’s get started! When it comes to the work area, you should know that it can significantly impact your safety and overall performance. You should always keep it neat, clean from any chemicals, and sharp, unnecessary objects that are not used at that moment. Make sure that the work area is always well-lit. These measures will minimize risks and prevent potential hazards. Furthermore, you should always check the stability of the work table before you start working. This especially refers to the area you will use as support for the joiner itself. Similarly, check the stability and functionality of the working area that will be used for heavier and larger pieces of wood. Also, don’t forget about the guards. Check if they are in place. There are some safety measures regarding wood piece choice and preparation as well. First of all, you should be familiar with the wood piece you will be working on. Check it thoroughly for cracks, especially on the edges you will be joining. Inspect it for checks and knots. These can modify or obstruct your work. Remember that you should not joint the edge with these flaws! Similarly, check the wood piece for any staples, screws, nails, and other metal particles. You should not joint those edges either. Neglecting the inspection can cause serious injuries if the machine blade comes in contact with any of the above-mentioned metal particles. The same goes for end grains. Inspect them thoroughly and determine the grain direction. Therefore, thorough and detailed inspection of the wood you will be using is the essential part of the preparation process that will ensure your safety and guarantee the quality of your work. Before starting the machine, you should ensure that the tools and equipment you will need are in place and ready for the job. First of all, check if the tools are damaged. Don’t use any tool that has visible damage as even small cracks or deflections may escalate into a bigger safety problem during the operational procedure. Pay special attention to the handles. When it comes to your personal safety, remember to always wear protective glasses/eye protection. Don’t wear long sleeves (or wear very tight long sleeves if you have to). Avoid loose clothing. Don’t wear any jewelry as it might prevent you from making the correct maneuvers and it might get caught in the machine. In addition, benefit from the push blocks, sticks, and paddles. You should always maintain the safety distance measuring 6 inches. This refers to the clear distance between your hands/fingers and the cutter head. Don’t forget that cutterhead is razor-sharp! Here are the safety measures that you must take before turning the machine on. These are among the most important biscuit joiner safety rules. Why? Simply put, if you don’t comply with these rules, you are risking your health and increase the likelihood of different workplace hazards. First of all, control the table and the cutter head before you start working. There mustn’t be any chips between them. Also, this is a good time to check the cutterhead guard. Remember that you must never touch it with your hands as they are extremely sharp. Then, adjust the fence. Remember that you must do all adjustments before turning the machine on. The fence must be locked in place. Also, it is a good idea to inspect the adjustments and the fence for damage before each use. Check the cut depth as well. Finally, check the machine cords before starting the biscuit joiner. If you notice any damage, don’t turn the machine on! Also, make sure that the conditions don’t involve any moisture. Use a GFCI protected supply to protect yourself if you cannot avoid a damp environment. Finally, we came to the most important part of this article. Here are the biscuit joiner safety rules during the operational procedures. Generally, you will have to pay attention to plugging/unplugging, the way you make the adjustments, positioning your body in relation to the machine, hand operation technique, and other biscuit joiner safety precautions. Let’s get started. First of all, remember to turn the dust collector on if your model has one. We do recommend getting a dust collector, as it will save your effort, time, and energy. Your working process will be safer as your view field will always be unobstructed. In addition, the machine, the end product, and the work area will be free of wood particles and dust. Here is a very important rule. Don’t forget to turn off and unplug the machine if you want to make any adjustment. This is true for changing the accessories as well. Even though this can be a tiring and time-consuming process, never underestimate the power of handheld power tools like this one and the dangers of doing these activities without turning it off and unplugging it. Also, remember that the blade must completely stop before you make any changes. When it comes to cutting the pieces, never cut those pieces that are too small to be safely supported. There are other joining options too. Even though the biscuit joiner is a versatile and super-useful tool, remember that there are some cases when you should not use it. Otherwise, you may jeopardize your safety. When it comes to your operating technique, we can say that it heavily affects your safety. First of all, we want to discuss the way you position your body against the work table and the machine. Remember that you must never bring your body in line with the movement of the blade! The consequences can be fatal. Simply put, this can lead to cutting yourself. Also, you should always stand to the left of the stock. Remember, never stand behind the stock! Why? You may get injured due to the kickback. Even though these cases are rare, you really want to be on the safe side. Mastering your body positioning technique is very important when you use a biscuit joiner. In addition, the two-hand operation is a must. It guarantees maximum accident prevention and full control over the machine. Each biscuit joiner has an auxiliary handle. Take advantage of it and keep your non-dominant hand on the handle. If your model doesn’t have the handle, place your hand firmly on the motor housing. This will increase your control level. As the blade is the potentially most dangerous part of the machine, you must pay special attention to the safety measures related to it. Namely, you should always ensure making the cleanest possible cut. Make a firm grip on the machine. In this way, you gain control and the end result will be better. A firm grip means a comfortable grip as well, not a grip that will cause pain or discomfort. What are other measures that result in a clean cut? You must be sure that the blade is always sharp. If you cannot sharpen it anymore, simply replace it. In addition, always use the machine after the blade reaches its full speed. Today’s advanced biscuit joiner models reach their full speed in a second or two. Therefore, a bit of patience is not going to take too much time. Here’s a very important rule: you must release the switch if you notice blade binding or machine stalling! Similarly, don’t force the biscuit joiner. The machine should do the job appropriately depending on the wood type, hardness, and quality. If you force it, you will not only get a poor result but might get hurt as well. Finally, don’t forget about the safety measures that you must take even after being done with the job. The machine is still potentially dangerous. Moreover, you must provide some maintenance and care in order to keep the biscuit joiner safe for the next use. This includes care and maintenance of the accessories and tools as well. First of all, when you are finished with the biscuit joiner, turn the machine off and wait until the blade stops moving. Then, unplug it or remove the batteries (if your machine is battery-operated). Never leave the machine plugged-in! This can be dangerous for many reasons, including flood danger, fire, or contact of children with the tool. Now, it’s time to clean the machine thoroughly. First, you should blow off the chips that you can see on the exterior of the machine. Then, pay attention to the dust bag. Most models today come with a dust collector or the vacuum tool. Even if you are in a hurry, it is a good idea to remove and empty the bag. Never direct the sawdust towards others or yourself! You can get seriously injured from the dust and wood particles. You can also clean the machine with a gentle, specialized cloth. Always take care of your fingers though. Don’t approach the cutter head. You can also clean the cord to remove any wood particles or dust. You must clean the machine from any grease, chemicals, and glue if it came into contact with those substances. Also, avoid using any chemicals for cleaning the machine. A gentle cloth will be enough. Next, store the machine properly in its case. Also, store all accessories after cleaning them according to the manufacturers’ recommendations. Firmly close the case. Again, we want to repeat that you must not leave the machine unattended, open or plugged-in, as it becomes a deadly weapon in hands of inexperienced people and children! 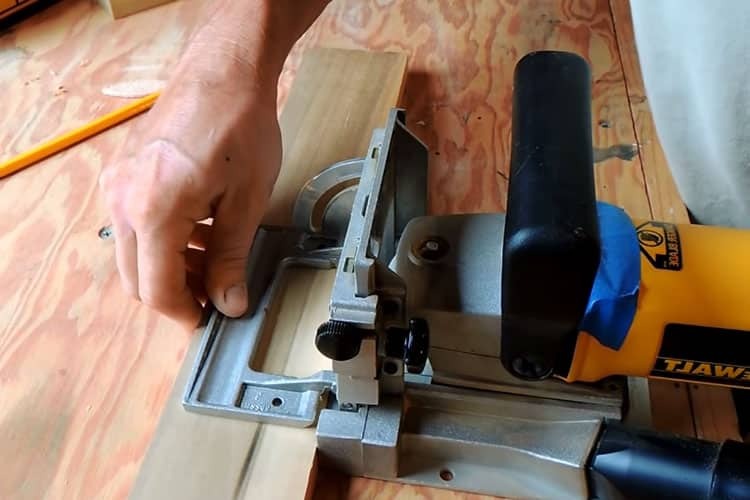 Even though using a biscuit joiner seems easy, especially if you are a skilled professional, there are plenty of dangers that may jeopardize your safety. This includes different kinds of situations related to an inadequate work area, damaged equipment, poor machine preparation, bad choice of wood type and size, poor wood inspection and preparation, inadequate clothes choice, lack of eyes protection, as well as poor machine operation technique. The latter, i.e. poor technique and lack of skills are the most dangerous situations. Majority of biscuit joiner-related accidents occur exactly due to the wrong technique, inadequate hand skills, and maneuvering, neglecting the recommended spacing rule, and improper body positioning in relation to the machine. However, it is good to know that the accidents with biscuit joiners are likely to happen only if you don’t comply with the safety rules we discussed here. This is why all biscuit joiner safety rules, including securing the wood piece, work area, your own safety precautions, and especially safety measures during the work itself are essential for successful use of a biscuit joiner. 5 What Is a Hammer Drill? 10 How to Use a Reciprocating Saw like a Metal and Woodworker?